Unfortunately, the dress you are looking for (Style: DQ-9325m, Name: DQ-9325m) is no longer available. 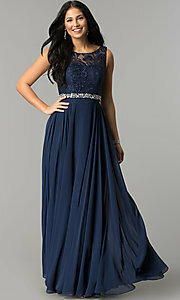 Looking for a long prom dress with a rich design worthy of the red carpet? This gorgeous formal dress, in soft mocha, combines a refined style with a dash of sparkle for a look that is ideal for black-tie events. A jewel-encrusted band adorns the natural waistline of this lovely prom dress, while topping the long a-line skirt. Gleaming lace on the scoop-neck bodice allows the sweetheart lining to show through and a low v-back adds a sultry detail to the elegant evening dress. A figure-flattering gown for formal events, this long chiffon mocha prom dress, under $150, is as affordable as it is beautiful. The model wearing black is 5'9" and wearing flats.